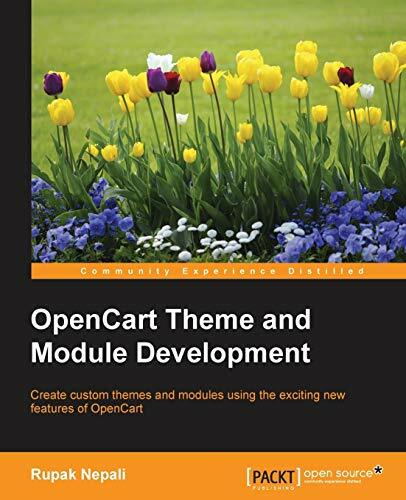 This book is aimed at developers and designers who want to start developing their own themes and extensions and for those who want to know about the code workflow of the OpenCart theme and modules. OpenCart is an e-commerce cart application built with its own in-house Model-View-Controller-Language framework. With its popularity and ease of use for e-commerce, OpenCart is being used more and more to create custom extensions, themes, and pages. This book embarks on an exciting journey of creating custom themes, pages, and templates in OpenCart. It shows you how to change and manage the general setting of your store and manage the modules and their layout, along with files and folders of the default theme. You will explore the featured module to help you understand module code and its functionality. Finally, you will learn to create customized pages for feedback management and make an admin section where you will make forms and lists to perform CRUD functionalities and show this feedback at the frontend. Rupak Nepali is from Nepal. He has been working as a PHP programmer and on the OpenCart framework since 2010. He has also completed many projects and built many modules on OpenCart to meet his clients' requirements. He is currently working as a web developer at Corner Edge Interactive, Arizona, and as a freelancer on Elance, oDesk, and other freelancer sites. Rupak holds a bachelor's degree in computer information systems from Nobel College, Kathmandu, Nepal. He is currently studying for his MS degree in computer science from the Maharishi University of Management, Iowa, USA.